A while ago I’ve created a system to be able to control my home ventilation fan by using a 433mhz remote dimmer. In this post I will be using Project Things by Mozilla to create a ‘Web Thing’ out of that same home ventilation fan. On the left, a raspberry pi with a 433mhz transmitter. On the right, the fan, the remote dimmer and a phone showing the Gateway Things UI (no worries, the wires go to a power adapter not my phone). I want to be able to control my ‘Things’ easily and as I’m a web developer by day (and by night), I prefer to use the web technologies well known to me. The Web Thing API initiative tries to standardize the definition of a Web Thing and its properties, fortunately it already seems to support my (very basic) requirements! An example of the Things Gateway UI displaying various Web Things that can be monitored and controlled. I will to need set-up two essential items to get this Mozilla Web of Things running within my network. First I need a Things Gateway in order to monitor and control Web Things. Basically it’s a web application, running on my raspberry pi, that can be used to scan the network for Web Things. Once configured it can be used to interact with the Web Things, provided that they have defined any interaction. Second, I need turn my fan into a Web Thing. This basically means that I will have to define the properties and behaviour of my fan. Afterwards it will be accessibly on my network by using web requests / web sockets. This, as well, will run on my raspberry pi as it is the only device I have with a 433mhz transmitter. Fortunately Mozilla provides instructions to set-up such a gateway on a raspberry pi. Since I didn’t want to reinstall my raspberry pi I’ve decided to check out the code and set up the gateway myself, using the installation instructions. This went surprisingly smooth; within no-time I had a Things Gateway set up with a public URL provided by Mozilla. If you need any help with deciphering the installation instructions, feel free to send me a message. If you need any help with this let me know, within minutes I had a Things Gateway set up with a public URL provided by Mozilla. Basically I followed the instructions and used the scripts in the gateway/image folder. An empty gateway, next up - create a Web Thing! The second step is to create a Web Thing that exposes certain properties, in this case an on and off switch and a dim/level property. The fan has 16 different speed levels and can be turned off (this means we end up with 17 levels, as ‘off’ is the lowest setting). Turning the fan off actually sets it to ‘idle’, it’s mandatory for the fan to be running as that is needed to ventilate the house. In my previous blog post I’ve already created some scripts that allow me to control the fan. On my raspberry I have a script called set-fan-level.sh, calling this script will turn on the fan and set it to a certain speed. For example ./set-level-fan.sh 15 turns on the fan on full speed and ./set-level-fan.sh 0 turns on the fan at the speed level just above ‘idle’. In order to create a web thing I’ve used the webthing npm package. I’ve created a Web Thing with two properties, an OnOffProperty and a LevelProperty. The LevelProperty determines the speed of the fan, and if I change the speed of the fan I immediately turn on the fan as well. The OnOffProperty reads the value of the LevelProperty and turns on the fan by calling the set-fan-level.sh script, or it turns the fan off by calling the stop-fan.sh script. As you can see; the implementation is pretty straight forward. 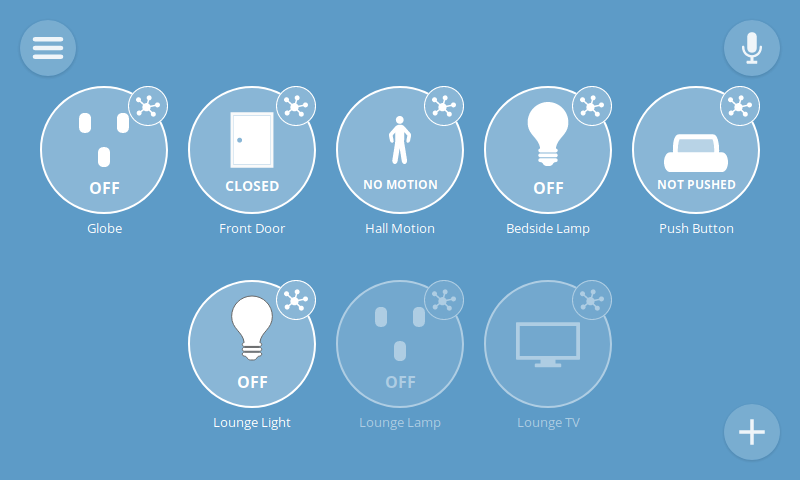 I’ve defined the fan as an OnOffSwitch, this allows me to switch it off easily from the Things Gateway UI. The LevelProperty can be set in the Web Thing ‘details’, and it ensures the OnOffProperty is set to true. Here I add the Fan Web Thing to the Gateway and control it by turning it on and changing the level. Web Thing (debug) logging on the right. // If adding more than one thing, use MultipleThings() with a name. // In the single thing case, the thing's name will be broadcast. As mentioned before, I’m running the code on my raspberry pi as well. It is the only device I have with a 433mhz transmitter connected to it and I need that to send messages to the dimmer connected to the fan. Once you run the code you will see the capabilities of your Web Thing by doing a GET request or browsing to the URL http://your-webthing-ip-address:8888. It returns a 200 OK and I hear the fan running on full speed! I hope I was able to show you how easy it is to wrap an existing (physical) device using the Web Things API. All I had to do was install the Things Gateway on my Raspberry pi and define a Web Thing for my home ventilation fan. The Things Gateway is accessible from within and from outside of my network and it provides a clean and simple PWA to control your Web Things with. If you’re interested in the code, you can find it here.